Good thing Anne isn’t into bowling. You guys. I was so trepidatious going into the Santa Clarita Diet finale because I was worried the Ball-leg Knights would be too easily dispatched and somehow Anne would be taken care of and then where would we be? But this episode was everything. It was so much better than my wildest dreams could have imagined—I laughed, I cried multiple times and my inner shipper clapped and squealed. Let’s dive right in, shall we? So, with Anne prepared to turn her case over to homicide, Joel and Sheila think their time is about up and they start to prepare for the idea of having to leave town. Their last-ditch effort to save themselves involves a rather brilliant plan of buying burner phones and having Gary “call Dan” and leave a message about meeting in Mexico with the money. If Gary and Dan are both still alive, Anne’s case is in tatters. So they get Gary to record a message, plant the phone in Dan’s flak jacket and then call it. Anne falls for it hook, line and sinker (because, hey, it’s a pretty good plan)... until she jangles the bracelets Sheila gave her and realizes where she has heard that sound before—on the message. That is the one part of the finale I did see coming, as soon as Sheila jangled the bracelets in triumph after Gary recorded the message. But that’s OK because I enjoyed waiting for that particular shoe to drop. This episode was tension-filled from start to finish and that just added to my anxiety. When Anne puts it all together, she tracks Joel and Sheila to the desert where they’re attempting to eulogize Gary and send him off to the great real estate development in the sky. He has decided he wants to die, so they’re trying to honor his wishes, but when it comes right down to it, they can’t shoot him because he’s their friend. And this marks the third time in the episode I cried. The first two times were Joel and Sheila’s two conversations about leaving town. First when she realizes he’s really thought about how they’re going to get away and go on the run, and then later when Joel says it has to be him who goes down for the murders because if they find out what Sheila is, she won’t even make it to prison. Then when Olyphant gets choked up because he can’t shoot Gary? More tears. And finally, when Sheila says it was always going to be her who confessed so that Abby could stay with Joel and have a normal life? More tears, you guys! Damn, the writers and actors absolutely killed it this episode. Then what is even more amazing is the resolution with Anne, which I should have seen coming but totally did not. Sheila tells Anne the truth and that, coupled with the fact that Anne’s bullets have no effect on Sheila and seeing Gary’s talking severed head, cause Anne to decide Sheila has “risen from the dead” and is doing God’s work by “ridding the world of evil-doers.” Which, I mean, is basically what the Hammonds are actually doing. It’s just a little awkward and weird that Anne treats Sheila like the second coming of Jesus. But hey, whatever keeps the Hammonds in Santa Clarita, right? While all this is happening, Abby still wants to blow up the fracking site. When Eric thinks she’s leaving town and he might never see her again, they kiss (!!!!) and then he offers to do it for her. But when they think the phone message worked and they’re in the clear, the two decide to go do it together—and the explosion happens right as Anne asks for a sign from God in regards to Sheila. Amazing. I can’t remember being this satisfied with a season finale in a really long time. Bravo, Santa Clarita Diet. The montage of Gary’s gag messages was so funny. I wonder if all of that was scripted or if they just let Fillion riff a bunch of times. 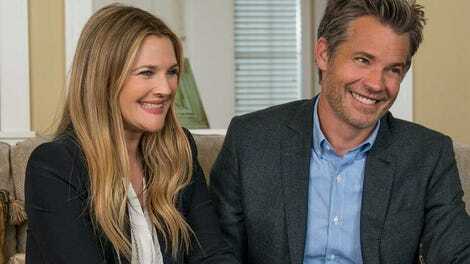 The more Olyphant and Drew Barrymore act together, they more believable they are as a married couple (and they were very solid from episode one). The patter when they were nervously explaining who they are to Bill Ramirez was really well done. Gosh, these two are my favorite TV couple right now. Sheila: “You packed all my lingerie, no shoes or pants?” If you’ll allow me an indulgence, one time I let my husband pack for us for a four-day trip and when we got there, I had one pair of underwear, three bras, no pajamas, four shirts and no pants. Seriously, guys? Joel: “It has to be me. Do you understand? If they find out what you are, you won’t even get to prison. So, please, I need you to promise if it comes to it, you’ll me take the blame.” TEARS. Love that Eric echoed Joel when he told Abby that he lost her once, he isn’t going to lose her again. Those two are the mini Hammonds, it’s really lovely the way the relationship is forming. Sheila: “Joel... it was always gonna be me.” ALL THE TEARS. Best marriage on TV.